Portable Solar Powered Message Boards are the most versatile means of getting your message to the motoring public. 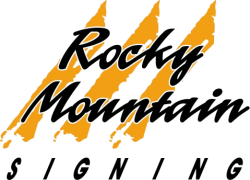 Rocky Mountain Signing is one of the top road sign suppliers in Colorado for message board rentals. We use Wanco Message Boards because of their dependability, superior visibility and wide range of functions. These message boards are used for traffic management during highway work, informing the motorist of approaching hazards and work zones, but are not restricted to traffic control signs. They are also used for sporting events, retail business, HOA’s, City and Counties, churches and utility companies. Do you need a traffic control sign rental or Portable Changeable Message Sign Rental for your next event? 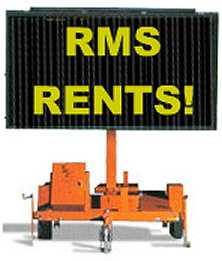 Call today to see how Rocky Mountain Signing can help you with your message board rentals. All of Rocky Mountain Signing’s message boards have a display panel of 135” wide x 75” tall. All panels have a message display of three lines with eight characters per line. Messages can be conveniently changed on site by using the onboard computer, or from our office in Parker. The message panel can also be rotated 360 degrees as well as raised increasing visibility to one mile. Each message board is solar powered with LED lights and auto dimming providing a long lasting temporary message display. We always deliver great customer service and are one of the most trusted road sign suppliers for Colorado for Message Board Rentals. Message boards are a bright, legible, and safe method of communicating with motorists. With one of the largest rental fleets in Colorado, Rocky Mountain Signing can supply all of your variable message board rental needs. We can deliver and install the message board to your project site, or you can come to our office for pick-up. All of our message boards meet the MUTCD (Manual of Uniform Traffic Control Devices) and all state, city and county specifications. Please contact Rocky Mountain Signing, the top road sign suppliers and source for Portable Changeable Message Board Rentals, the next time you need a message or traffic control sign rental board by the day, week, month or longer.